A few months ago we started putting together the July/August issue of the magazine, which focuses mostly on the war on drugs. (The full package, “Totally Wasted,” is here.) When my editors learned that I live the life of a monk — I don’t drink, I don’t do drugs, and I’ve never taken even a single toke of marijuana — they were pretty amused. So they decided I should write a piece on marijuana legalization. And I did. Going into this assignment, I didn’t care much personally about cannabis legalization. I just had a vague sense that if other people wanted to do it, why not let them? But the evidence suggests pretty clearly that we ought to significantly soften our laws on marijuana. Too many lives have been ruined and too much money spent for a social benefit that, if not zero, certainly isn’t very high. The bad news is that, at least for now, the chances of fully legalizing marijuana are essentially zero. We may continue to make progress toward partial decriminalization, which is better than nothing, but at least in the near future that’s about all we can look forward to. Read the article to find out why. The rest of the piece is a look at what the likely effects of decriminalization and legalization would be. Some of them may come as a surprise, some of them won’t. 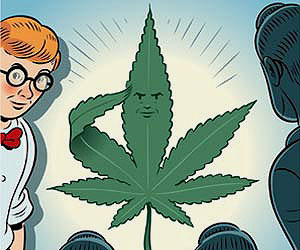 As for the title of the piece — “The Patriot’s Guide to Legalization” — well, I’m not really sure what it means either. I just write the text around here and let other people worry about the creative bits. I think it’s meant to go with the picture, though I have to say that perhaps “The Geek’s Guide to Legalization” would have fitted the illustration better. Anyway, now that that’s done, maybe I should try some pot one of these days. After all, do I really want to go to my grave not knowing what it’s all about?